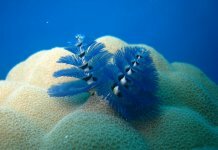 Home Photography Photo Lembeh Style !! an overview of our latest photo trip. Lembeh Style !! an overview of our latest photo trip. To be honest I’m struggling a bit with what exactly to talk about this week, not because I’m bereft of subject matter, but rather that I have too much. Too many photos, too much great food and too much being waited upon hand and foot. I stayed with our Indonesian photo trippers out on Lembeh Island which lies on the east side of the North Sulawesi mainland with which it borders the famed Lembeh Straits that run in a narrow channel with Bitung a busy sea port terminal at the southern end. Critters at Lembeh map board showing the position of the resort, and the names of the dive sites that are peppered up and down the coast of the mainland and the island itself. Most are no further away than around 15 or 20mins, with many being within 5 mins short journey. 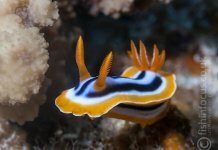 It draws underwater photographers and divers from all four corners of the globe to marvel at and shoot some of the craziest marine life you’re ever likely to encounter. In fact there’s a documentary aptly titled the Weirdest Square Mile on Earth that’s worth a gander at on YouTube. I have been to Lembeh a few times now, but this is the first time I’ve stayed on Lembeh Island itself, and we’re staying at Lembeh Resort with the dive operation managed by Critters@Lembeh so far the slickest and best organised dive team I’ve ever encountered. Lauren Siba the dive manager and the hotel manager Petra make a formidable team, friendly and always ready to deal unflappably with any issues that may arise. An aerial view of the resort taken by their Photo Pro Sascha Janson, on his DJI Phantom, this guys got all the toys!! I can honestly say that I’ve never been asked before if the pillows in the rooms were to my liking, and not to thin and were whatever my particular preference is. Which was exactly the question I got asked going to breakfast the other morning. The food has also been very good with a sturdy breakfast, with loads of choice, a buffet lunch, and a menu for your evening meal which so far hasn’t disappointed. I’ve just mentioned at the top of the page about the desserts I’ve scoffed, which rounded off a locally themed meal tonight, a barbecue and a variety of delicious Indonesian specialties, including their own take on sashimi which was insanely good. This was the location of our room, and you really do get a feel that your are living right in the jungle itself. 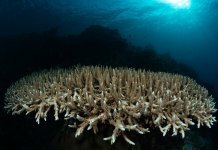 Ok, back to the diving and photography Critters@Lembeh was chosen because we’d heard great things about it, from underwater photography enthusiasts far and wide. Our particular branch of photography is a fairly small world so news travels fast amongst us all. I can tell you it hasn’t disappointed. All you have to do when it’s time for a dive, is make sure your camera is ready in the camera room, where individual booths with charging points, and towels for your camera await. Then you go and check your nitrox if using, and put on your suit. Everything else is taken care of, your camera is taken on the boat and your kit is on a tank, before you take the very short walk to the boat. After that you and and your buddies disembark, and make the short trip to the dive sites. Every buddy pair gets their own locker for all their kit, but to be honest, you don’t really need to do much as the guides replace everything and then also kit up your tanks on the boats ready to dive, so all you really need to do is make sure it’s all their at the beginning of the trip, after that it’s pretty much taken care of for you. They are well aware that I’m not in favour of over manipulation of the marine life and have simply been finding things and pointing them out, but you’d have to be blind and naive diving here in the Straits to think this doesn’t go and I wrote a blog previously about something that happened a couple of years back (click here) with another outfit,and a follow up to that in another blog very soon. I’m happy here though that they do care enough about the marine life to not stress it just so a guest can get the perfectly positioned shot. 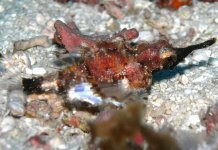 And I’m not going to move a frogfish to a better position with my fingers or muck stick and so far nor have they, and apart from the stress it causes the marine life, I personally think it devalues your resulting pictures. As I said though I will talk about this in another blog soon. 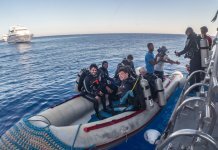 The order of your days is up too you, with boats leaving at 8am, 1045am and 0230pm every day, with night dives and Mandarin dives scheduled in advance or accordance to numbers requesting. 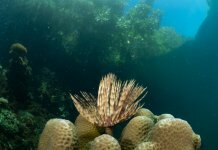 There is also the fabulous opportunity to dive the house reef at any time and apart from a nitrox surcharge is completely free if unguided. You also have the option to do this solo too, as long as you abide by their rules. Our group on the whole elected to take the regular boat dives to sites which we left up to the guides. Site choice is based upon customer requests and what is happening at the sites. The guides not only communicate with each other but also with their friends at other resorts. 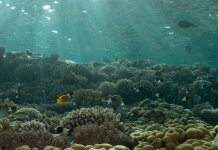 This results in the most up to date info on marine life locations that I have ever witnessed. The little private jetty with the pool area behind which we tended to use mostly between the first and second dives for coffee and peanut doughnuts !! Underwater the guide to guest ratio is never more than four to one, with the option to pay for private guiding if you so wish, in fact you can even have your own boat and guide if you are willing to pay for it. 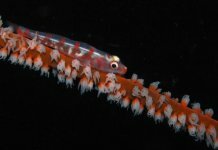 I’ve dived in Lembeh a few times previously, and always been amazed at the crazy creatures on offer, but here at Critters@Lembeh they’ve elevated the standard of guiding to another level. Your guide has a magnetic slate, upon which they write the name of the next creature found (often using the latin names clever buggers!) which gives you a choice to pass on it and stay shooting what you’re with or to move on. Guides I’ve had so far have been Mikael, Iwan, Jhoe, Opo K and Opo S, who’ve all been brilliant and impossible to pick a favourite from. Jhoe one of our excellent guides, with an encyclopaedic memory of the marine life, including the latin names, these guys are seriously bright cookies. 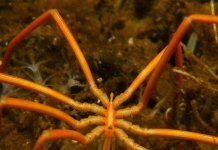 They are very good at managing a group of underwater photographers and they always make sure that everyone has seen the stand out critters. They manage equally well the fact that some divers are diving nitrox and thus can stay at a lower depth for a bit longer and try and divide the group and the dive profiles accordingly. Although you are left to manage your own no deco limits, but you must be careful to keep an eye on these as photographers are only too easily distracted by getting the shot, and a couple of our number were caught out once or twice with this. So whilst they look after you very well it’s unfair to expect them to also mother you. The pool area which looks out to sea, with morning doughnuts and coffee, whilst discussing the last dive. Normally after our morning dive I would be in the camera room chatting with folk about shots and things that they had encountered on the dive, and then we would retire to the poolside for snacks and coffee to carry on our conversations , before the call for the next dive. Critters@Lembeh has a very well appointed camera room, with even fresh camera towels to dry your kit off with, and powerpoint aplenty. After the third dive of the day, unless night diving, I would retire to the bar area where we could review the days shooting and provide some instruction with Adobe Lightroom and Photoshop over the odd cocktail, not a bad teaching environment and I’m sure our hard pressed teachers up and down the land would welcome such a mentally stimulating environment to dispense their pearls of wisdom from. It’s also worth pointing out that we had a non diving participant on this workshop, Rita who came along with her daughter Dawn who was diving, and most days she spent out and about shooting in the jungle or at the local villages, and I was very envious of the great shots she got that showed a whole other side to a trip to this part of the world. Next time I come I would like to schedule some local excursions too, as I think they make great photo opportunities, but with a packed diving itinerary it’s difficult to do this. I’ve mentioned the ladies who manage and run the resort and the diving but as a photographer and fully card carrying geek, it would be unfair not to mention Sascha Janson, Lauren’s partner and the in-house photo pro. He was always ready to help and advise and is a renowned videographer and underwater photographer himself with a handle on all the latest photo knowledge and technology, which living in a remote corner of the globe is no mean feat I can tell you. He also has possibly the best equipped ‘Man Cave’ (Lauren’s words not mine) that I have ever lusted over, I mean he even has his own 3D printer for goodness sake! with which he prints out a variety of underwater photo orientated accessories on site. In fact one of our number took advantage of this and decided upon a 67mm flip diopter for her macro lens. And when one of our party had an inadvertent flood he whisked her camera off to his purpose built drying chamber, awesome service. Sacha in his superbly equipped “Man Cave” teaching a course on lighting. Some of the kit available for hire from compact to full blown DSLR setups. Rounding off the in house expertise is a person I wish I had managed to find the time to have a proper chat with, Dimpy Jacobs a home grown Indonesian Marine Biologist and Dive Instructor who dispenses help and advise about the amazing marine life on offer in the Lembeh Straits, and now that I know about her skills I’m hoping that she will give out some talks about the critters next time I visit with a group, and coming here again of that I am most certain, as this has been an absolute gem of a trip, with really nothing to fault it at all. Dimpy Jacobs, Critters@Lembeh inhouse marine biologist, dispensing critter advice and much more for you. 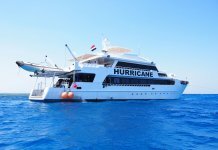 The best of photo diving, the best of service, all dished up in amazing and very comfortable surroundings. And of course there is also a Spa to sooth your “tired” muscles after a hard day floating around and simply pressing your shutter release, seriously just being here diving and eating their great food is relaxation enough, but what Indonesian resort would be complete without a Spa, so you can take your chilling out to the absolute max. A spa in the middle of a tropical jungle, nice. The title of this blog came about because our guides would often finish the briefings with the idea that the general dive plan was quite flexible and based more upon the marine life locations than any particular rigid route, which they called Lembeh Style, which we took to be a variation on Gangnam Style, which we felt duty bound to try and dance to, and what they thought of the gyrations of a fifty year old man simulating this I can only guess!!! The title does however have a double meaning and that is that these guys and gals at Critters at Lembeh and the Lembeh Resort do their jobs with willingness and always smiling, combined with panache and efficiency that equates to what I can only label as Lembeh Style. Here are some of the hard working guides leaving the island after they’ve finished work for the day, and they are seriously some of the hardest working guides I have ever encountered, with your happiness at the heart of their motivation. But I thought that only our UK based readers would get the reference to excellence that this title would have conveyed. This was just an overview of the resort that we were based at, expect more specific blogs about the marine life and the photography in Indonesia, over the coming weeks, as for now I have many many gigabytes of pictures to go through and edit, such was the productiveness of this years Indo excursion.